The Combi Fold N Go Stroller gives greatest convenience while encompassing a lightweight, compact, and portable design. The self-standing baby stroller features a one-hand quick fold and a sleek aluminum framework. The padded seat includes a 5-point harness system with plush harness pads for your baby’s comfort. 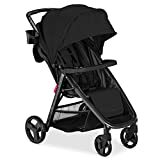 The extra-large canopy with a mesh ventilation window enables you to keep an eye on your little one at all times and allows air to flow quickly in and out of the seating area of the infant stroller. Double front wheel suspension ensures a smooth trip while the lockable front swivel wheels improve maneuverability. One single step locks both rear wheels simultaneously, making it easy to park and stroll as you wish. A parent mug holder, big basket, and canopy pocket provide storage of essential items right at your fingertips. With a weight ability of 50 pounds, a child cup holder, and a multi-position recline, the Fold N Go is perfect for children 6 months and older.